The moment I decided to visit Copenhagen, I knew a trip to BYOH Matcha was on my itinerary. How it could it not be? After all, BYOH is the “No 1 Leading Supplier of Matcha in Scandinavia.” Of course I was going! Commuting by bike, as is the way in Copenhagen, I discovered the storefront when my eye caught a glimpse of the pinkish-purplish sign on the sidewalk, which on the one side read, You had me at matcha, and on the other, Choose happyness and drink matcha! This was obviously a place for me. Just a few steps down and I found myself in a small space, which immediately conjured up memories of Holy Matcha in San Diego, a space decorated in millennial pink and white, with large green leaved flora print covering the walls. Matcha Mike, the founder of this establishment, said he was inspired by their aesthetic, yet his walls are more purple and thankfully, given the size of his space, the floral pattern is only used as background for the wall menus. The Holy Matcha space is much larger and can use such bolder themes. Michael Kristensen, aka Matcha Mike, stood behind the counter and graciously answered my barrage of questions, eager to share his venture into the world of matcha. His initial spark occurred while on a trip to California in 2013 as an elite tennis player. At the time he was consuming coffee and energy drinks, like Red Bull, but suffered from fatigue, poor sleep, energy crashes, and general aches and pains. That all changed when someone introduced him to matcha. Surprisingly and suddenly, he had more energy throughout the day, his body ached less, and he slept better. That was all it took to create a lifestyle shift. With improved vitality, he gave up all of those other vices, returned to Denmark and embarked on a path to bring matcha to the people. Currently he distributes his matcha to over 100 outlets in Denmark, and in his small shop he sells three different grades of organic matcha, as well as individual packets of instant matcha (unfortunately while only minute amounts, these do contain soluble fiber for water absorption). Currently, plans are in motion to sell matcha drinks to none other than 7-11 in Denmark (if you are from the States and like I, you would never have dreamed 7-11 would carry healthy food items like chia seed pudding, paleo salads with quinoa and fresh salmon, and more, but it does. I actually bought a few prepackaged meals to take back to my flat and they were satisfying and rather tasty - keep in mind, my expectations for 7-11 are quite low). At BYOH, Matcha Mike makes his own homemade cashew milk, so I was eager to try a hot matcha latte, and it didn’t disappoint. It was delicious, and perhaps one of the best cashew milks I have ever tasted. Smooth and rich, it did not overpower the matcha. Not wanting to overindulge, I returned the following day to try the cold version over ice. I have never been a fan of cold tea. Over the decades, friends, including teahouse owners, have tried to change my opinion by offering me their favorite iced tea, yet rarely have I been won over, even during hot summer afternoons. I find cold tea lacking in flavor and depth. Since this concoction was primarily cashew milk, I thoroughly enjoyed it and consumed it all too quickly. Mike prefers cashew over almond, and even cow, milk due to its lower calcium content. According to Mike, too much calcium makes the matcha bitter and prevents absorption of nutrients. Calcium and caffeine have an interesting dynamic, as well. First, caffeine causes your body to excrete calcium, so the more caffeine you consume, the greater your calcium excretion. Second, caffeine further blocks your body's ability to absorb calcium. If you are hoping to get your daily dose of calcium via your matcha latte, this is most likely not going to happen. A 2007 study showed that the proteins in cow’s milk bind with the catechins in tea, thereby blocking their absorption. In a 2013 European study the impact of dietary proteins in soy milk was shown to also block absorption of catechin in green tea. 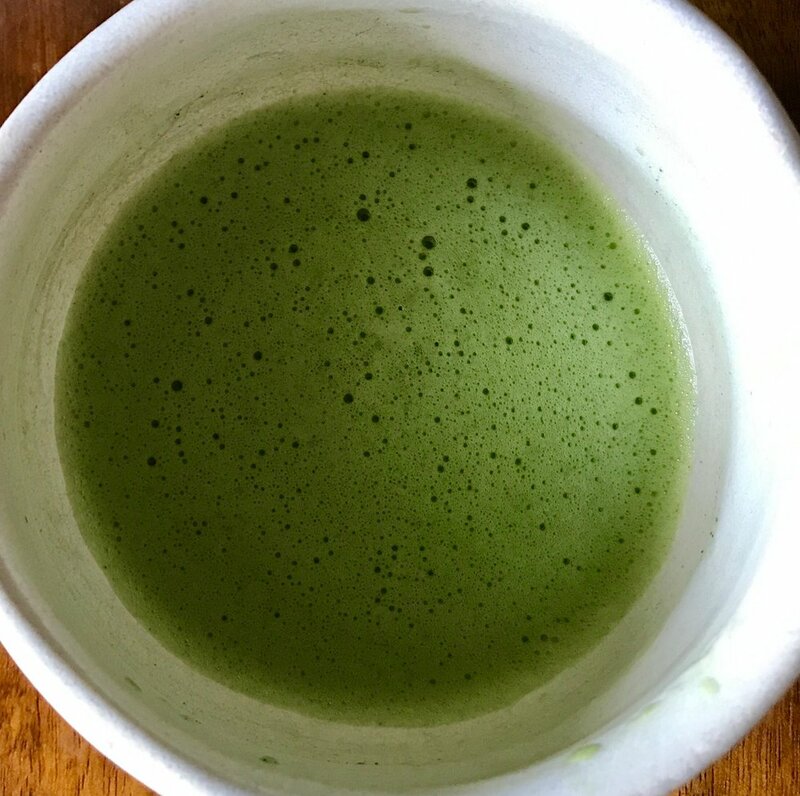 The recommendation then is to use a milk substitute that is low in calcium and protein (such as cashew or coconut milk), or at the very least select one without any added calcium, in order to obtain the benefits of the phytonutrients in matcha, if that is the goal. I did not have a simple bowl of matcha at BYOH, or any of several matcha items on menu, so I am unable to speak to those. I did, however, purchase a few packages of the highest grade organic matcha to take home. Today I opened the resealable bag and transferred the powder into one of my air tight containers and let it breathe for a bit. Both the color and aroma were much flatter than anticipated. The powder was quite fine, sifted well, and whisked easily. However, a slight bitterness is the note that lingers, and any umami flavor was not very pronounced. While I am pleased to find another organic matcha source, even this premium grade is one I will probably use for lattes or cooking. Still, for all you matcha lovers out there, when in Copenhagen, please visit BYOH and Matcha Mike for one of the most delicious matcha lattes you can find, hot or cold!